← Wal-Mart and Foreign Corruption — Where is the Corporate Responsibility; Where is the Federal Prosecution? Wal-Mart is the latest multinational corporation now facing allegations of illegal payments to foreign government officials. This raises issues of corporate responsibility, economic growth, our values, and U.S. global leadership. This case involves questionable corporate payments under both U.S. and Mexican law by Wal-Mart to help expand its stores in Mexico. Other recent allegations, among many others, involve bribing Chinese officials to allow U.S. films to be shown and by U.S. firms to promote real estate investments in China. “Wal-Mart Covered Up Bribery, Report Says.” Washington Post (April 22, 2012); ”Vast Mexico Bribery Case Hushed Up by Wal-Mart.” New York Times (April 22, 2012); “Wal-Mart Corruption in Mexico.” (CNBC video April 23, 2012). 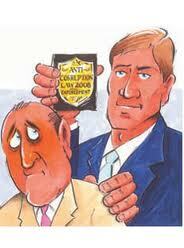 Enacted in 1977 the FCPA makes it unlawful to bribe a foreign government official to obtain or retain business. U.S. parent corporations may be liable for their foreign subsidiaries. In 1998 the legislation was extended to foreign corporations within the U.S.
Justice Department prosecutions under the Foreign Corrupt Practices Act(FCPA) have grown greatly under both the Bush the Obama administrations, justifiably so. The U.S. Chamber of Commerce has been aggressive in trying to change the foreign corruption law. Many others have argued that nothing should be done to make the U.S. less than a leader, as it is now, in the ethical conduct of international business. In fact, they argue that the law should be broadened. ”Bribing Foreign Officials.” Washington Post (2.27.12). The OECD has multilateralized the earlier unilateral approach of the U.S. from the post-Watergate era. The OECD Convention was based upon the FCPA. That action by the OECD in a sense validated the earlier U.S. unilateral action in this sphere of global trade relations and international economic politics. In fact, the 1999 OECD Convention in many ways is even stronger and broader than the FCPA. The OECD claims most major countries as signatories to the anti-bribery convention, now including the Russian Federation. While India and China are not signatories they have participated in the OECD deliberations. The U.K. and South Africa have recently adopted new domestic legislation concerning foreign corruption. There seems to be a global convergence of norms concerning global business bribery, based upon the OECD and the earlier U.S. legislation. This convergence weakens significantly the position of those, for example the U.S. Chamber of Commerce, who contend that enforcement of U.S. law would restrict the competitiveness to U.S. firms doing business globally. It is important to note that the federal legislation was enacted after various states had adopted their own international commercial bribery laws or expanded the common law notion of commercial bribery. This shows the interesting nature of federalism and the role of states in global trade, as often being a head of the federal government in confronting global obstacles. The passage of the FCPA was a great success story for the U.S. view of the necessity of ethical international transactions. In fact, the OECD is now pressuring the U.S. to further limit its “facilitation exception,” which U.S. courts have already done to a significant degree. So the question is will there be a federal investigation and prosecution of these latest allegations of bribery and corruption by a U.S. multinational abroad? And what about U.S. firms in China, India and elsewhere? For a good review of FCPA cases (2007-2011), countries and companies involved see my recent collection of charts and excerpts from the USDOJ document (“Lay Person Guide“). Malawer, “Corrupt Practices Prosecutions.” (April 2012). See also the Lay Person Guide from the USDOJ. These documents indicate the absolute aggressive prosecutions by the USDOJ, extensive extraterritorial application of FCPA, and the huge criminal fines involved. At the bottom of all this is the broader question of the responsibility of corporations in both the U.S. and the global system. It’s really about values and who we are. Is the United States exceptional or isn’t it? U.S. firms have refused to pay bribes and U.S. global commerce has expanded exponentially over the last few decades. Wal-Mart and others may will begin to see the domestic consequences of their overseas criminal or almost criminal actions. Shareholders will most likely start to hold ineffectual board members responsible. Whistleblower and shareholder litigation is always possible and the “business judgment rule” may not always be a viable defense. Hopefully, some board members may even be energized to become proactive to implement their statutory and fiduciary duties. Domestic government agencies, both local and national, may well become more vigilant tin assessing the corporation’s business proposals and activities. Global actions have domestic consequences. Once your brand or reputation is ruined, it is ruined. You don’t want to be known as the Enron of retailing. You don’t want ever to link the name Wal-Mart with Watergate. It isn’t a good idea. The fact is that most people and governments around the world understand the insidious and dysfunctional nature of both domestic and international bribery at all levels. Bribery has a terrible impact on economics development and true economic competitiveness. The issue of corporate bribery in international transactions is an area that the U.S. should retain its global leadership and move forward aggressively. This entry was posted in Global Trade Relations and tagged bribes and long-run consequences, corporate responsibility, economic development and bribes, extraterritorial application of FCPA, facilitation exception, FCPA, foreign corruption, global leadership, multinaitonal and corrupption, new U.K. corruption law, OECD Convention on Anti-Bribery, South Africa / India / China foreign corruption law, U.K. / India foreign corruption law, U.S. Chamber, Wal-Mart. Bookmark the permalink.